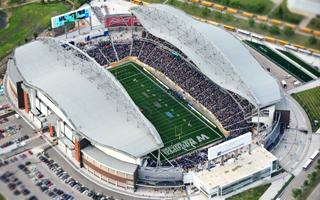 The wavy roof of Investors Group Field (IGF) was expected to become its landmark. So far it also proved a burden as water from melting snow falls from lower parts of the roof straight onto the buildings below. With the large amounts drainage failed and water damaged some rooms inside. The venue's operator BBB Stadium Inc. confirmed on Tuesday afternoon that some suites and the visitors' locker room has water damage. The company refused to into details, assuring that contractors are already working on repairs and the issue will not affect IGF's event calendar. Officials with the Winnipeg Blue Bombers have refused to comment and won't let the media see the damaged areas. This block caused further criticism and even earned a comment from Winnipeg mayor Sam Katz. While Blue Bombers are the ones dealing with most imperfections in the long term, so far the stadium has proven a burden for all of Winnipeg. It came a year later than expected, exceeded the initial budget and now requires additional improvements to host major events. The province recently announced a total of $5.5 million in loans and grants to improve the stadium before it hosts the 2015 Grey Cup final, along with an additional $3 million to winterize the facility and make it more energy efficient.